This review contains spoilers for both The Winner's Curse and the Winner's Crime. 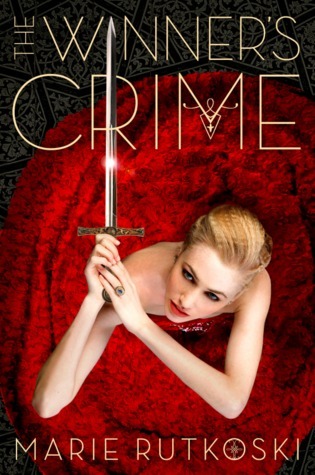 I was a huge fan of The Winner's Curse, and The Winner's Crime was at the top of my "2015 Releases that I'm Fangirling Over" List, so it was kind of awkward when the release date came and went and I COMPLETELY MISSED IT. Now that I've read it (and mulled over my thoughts a little), I can honestly say that Rutkoski has upped her game with this one. The ending of The Winner's Curse completely made my jaw drop. Kestrel sacrificed her own freedom in order to ensure Arin's by agreeing to marry the Valorian prince, and The Winner's Crime sees her deal with the ramifications of that decision. It's a lot darker and more tightly plotted than its predecessor, and Arin and Kestrel's romance is pushed aside in order to put the politics of this world on display. If you saw my reaction to Jaclyn Moriarty's The Cracks in the Kingdom, you will know how much I love political intrigue. Needless to say, I loved watching Kestrel play the game: Rutkoski has taken the time to let us see the full scope of Kestrel's intelligence and cunning. Now that the stakes have been upped for Kestrel, now her relationship with Arin and high society life are no longer her primary concerns, we are able to see her plot and scheme and spy. Even though we see Kestrel as "good" and we are supposed to want her to succeed, she is a three-dimensional character who is filled with shades of moral greyness and who is forced to make hard decisions, and sometimes that means she makes decisions that the reader doesn't necessarily agree with. Sometimes she makes decisions that will make your stomach turn... until you realise the alternative is still worse. Kestrel doesn't have the luxury of having friends or allies to count on - she can only rely on herself. I was less impressed with Arin - I spent most of the book being emotionally detached from his plight, if only because a lot of his problems would be fixed if he bothered to listen to the people around him. Actually, I spent most of this book wanting to smack Arin, if only because he is impatient and allows himself to be blinded by his emotions. Rutkoski may be writing for a YA audience, but she doesn't make the mistake that so many YA authors make, and assume that just because her (demographic) audience is younger they are less intelligent. Her writing is mature and while she drops clues for her more attentive readers, she won't spell it out for them until the big reveal comes. That said, there are moments that genuinely surprised me. From the ending, it appears we'll get a new setting (or two) in the final installment, and watch Kestrel and Arin tackle a new array of problems (and not in the Veronica Roth "I'm just going to drop the plot of the last two books" kind of way).